STAC VIP leads the charge in migrating old-fashioned on-air telephones to dramatically clear wideband audio quality. 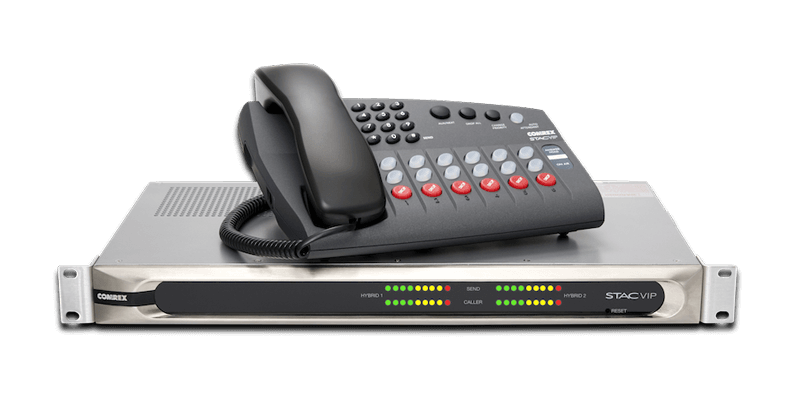 STAC VIP smoothly integrates legacy POTS lines with VoIP technology to deliver a new way to manage telephone calls for talk shows, interviews, and contests. Able to take traditional calls, STAC VIP also breaks new ground by handling calls from “HD Voice” capable telephones and smartphone apps. Complete with the STAC IP Call Screening and Control Interface, the STAC VIP Caller Management system will even integrate with your VoIP PBX system. STAC VIP is equipped with the familiar STAC Control Surface. Bright, colored LEDs and an ergonomically friendly button layout give simple control and a concise overview of all callers at a glance. STAC Control Surface integrates unique features like the “Auto Attendant Feature”, which answers calls and plays a custom message before placing a call on hold. Because the STAC Control Surface connects to the mainframe over IP, it can be located anywhere IP connectivity is possible – even off-site. At the core of STAC VIP is a sophisticated engine that can process various types of incoming calls. STAC VIP can process up to 6 incoming VoIP calls on a single DSL line utilizing G.729 audio compression (12 calls, if using the STAC VIP 12). By employing a single DSL instead of multiple POTS or ISDN phone lines, users can save a whole lot of money. Not ready to go entirely VoIP? No problem. STAC VIP can easily accommodate traditional POTS and ISDN phone lines. By installing VoIP Gateway devices (available from several manufacturers), existing POTS/PTSN, ISDN, and T1/E1 telephone lines can be converted to a SIP compatible VoIP trunk for connection to the STAC VIP mainframe. Numerous broadcast facilities depend on IP-based PBX systems to deliver telephone calls throughout their offices. However, routing a call from the front office switchboard to the on-air studio is often difficult, if not impossible, to accomplish. STAC VIP simplifies the process by allowing for easy extension sharing and integration with SIP-based PBX systems. During VoIP calls, STAC VIP uses a protocol called SIP (Session Initiation Protocol) to determine which audio codec will be best for the call. When a call is placed to STAC VIP from a VoIP telephone, a soft codec, or a smartphone using a compatible app, STAC VIP will negotiate to find the highest quality codec supported by the caller’s device. The result is crystal clear, high quality caller audio for you and your listening audience. The wideband HD voice standard requires that calls can be processed at a higher quality than the narrowband 3 kHz frequency required in the telco industry for over 100 years. 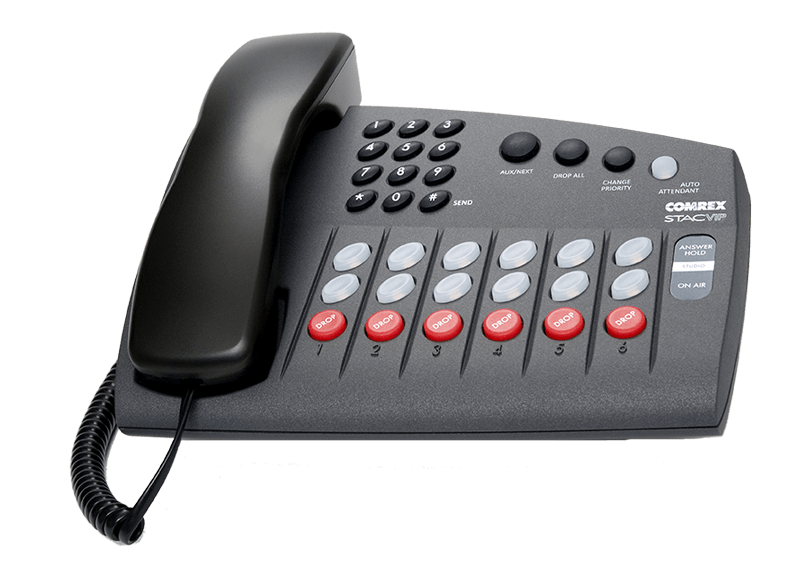 Many new HD-Capable VoIP telephones offer high quality audio codecs such as G.722 and Speex. STAC VIP supports incoming wideband voice calls at a high level of quality from these new VoIP telephones, as well as calls from wideband voice capable smartphones and soft codecs. 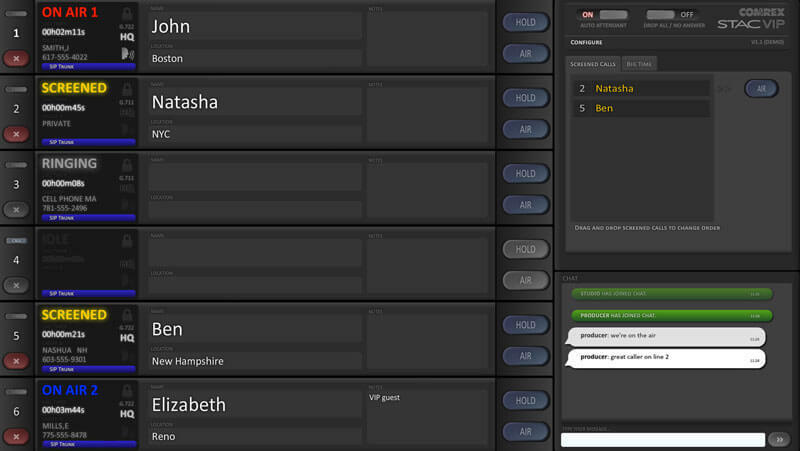 Now your callers can sound like in studio guests! STAC IP is an integrated Call Screening and Control interface that runs natively on STAC VIP. By logging into the password protected GUI from a local web browser, you can access basic call screening functionality such as caller name, location, and notes. STAC IP also provides caller ID information when available. Used in conjunction with the STAC VIP Control Surface Hands Free mode, a call screener can use STAC IP to answer and screen callers, and even text chat with a host in a different studio. The STAC VIP Mainframe is the central point of the STAC system, where outside calls meet with STAC VIP’s control, management, and audio interface functions. Two independent Hold Audio inputs are provided, allowing STAC VIP to be shared between studios. Two Ethernet ports provide WAN connections to all telephone line sources, and LAN connections for local STAC VIP Control Surfaces and local interface control. Up to four Control Surfaces can be supported per mainframe. Includes 6-line control surface and cables. Includes 12-line control surface and cables. License unlock code provides the ability to use STAC VIP in Split Studio mode. Firmware version 2.0 or higher required. Additional STAC6 VIP Control Surface required for full functionality. Includes control surface SideCar with metal attaching plate and activation key for lines 7- 12. *Please provide an email to send the activation license to and serial number of the STAC VIP mainframe. To purchase SideCars for additional control surfaces, please inquire on pricing.